Understated detailing and Cast Brass construction make this wall sconce the perfect finishing touch to any traditional room. 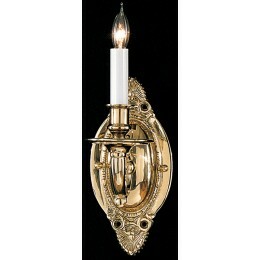 The Crystorama 621-PB Arlington collection Sconce Wall Lighting in Polished Brass uses Incandescent light output and brings Antique style. This item is 12"H x 5"W x 6"D. The total wattage is 120 and the voltage is 120 volts. The Crystorama 621-PB requires 2 bulbs.